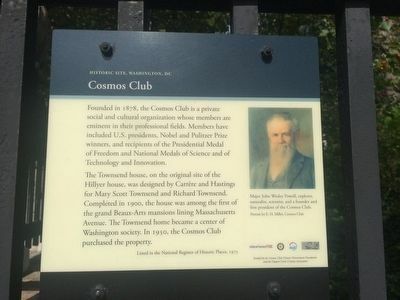 Founded in 1878, the Cosmos Club is a private social and cultural organization whose members are eminent in their professional fields. Members have included U.S. presidents, Nobel and Pulitzer Prize winners, and recipients of the Presidential Medal of Freedom and National Medals of Science and of Technology and Innovation. The Townsend house, on the original site of the Hillyer house, was designed by Carrère and Hastings for Mary Scott Townsend and Richard Townsend. 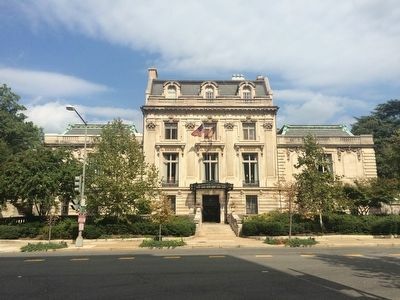 Completed in 1900, the house was among the first of the grand Beaux-Arts mansions lining Massachusetts Avenue. The Townsend home became a center of Washington society. In 1950, the Cosmos Club purchased the property. Major John Wesley Powell, explorer, naturalist, scientist, and a founder and first president of the Cosmos Club. The marker can be seen at the far right, mounted on a black metal fence. in Dupont Circle, District of Columbia, in Washington. Marker is at the intersection of Massachusetts Avenue NW and Q Street NW, on the right when traveling north on Massachusetts Avenue NW. Touch for map. 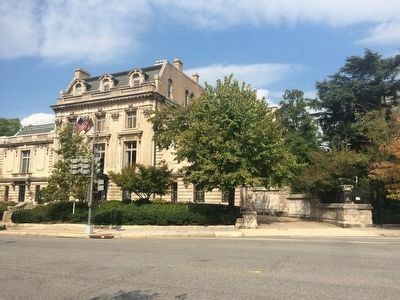 Marker is at or near this postal address: 2121 Massachusetts Avenue NW, Washington DC 20008, United States of America. Touch for directions. Other nearby markers. At least 8 other markers are within walking distance of this marker. The Society of the Cincinnati (within shouting distance of this marker); Mahatma Gandhi Memorial (within shouting distance of this marker); Tomáš G. Masaryk Memorial (about 300 feet away, measured in a direct line); George Washington (about 400 feet away); Indonesian Embassy/Walsh-McLean Mansion (about 400 feet away); Liberation of the Grand-Duchy of Luxembourg (about 500 feet away); American News Women's Club (about 500 feet away); 2019 Q Street NW (about 500 feet away). Touch for a list and map of all markers in Dupont Circle. More. Search the internet for Cosmos Club. Credits. This page was last revised on January 27, 2017. This page originally submitted on October 8, 2015, by J. Makali Bruton of Querétaro, Mexico. This page has been viewed 308 times since then and 7 times this year. Photos: 1, 2, 3. submitted on October 8, 2015, by J. Makali Bruton of Querétaro, Mexico.